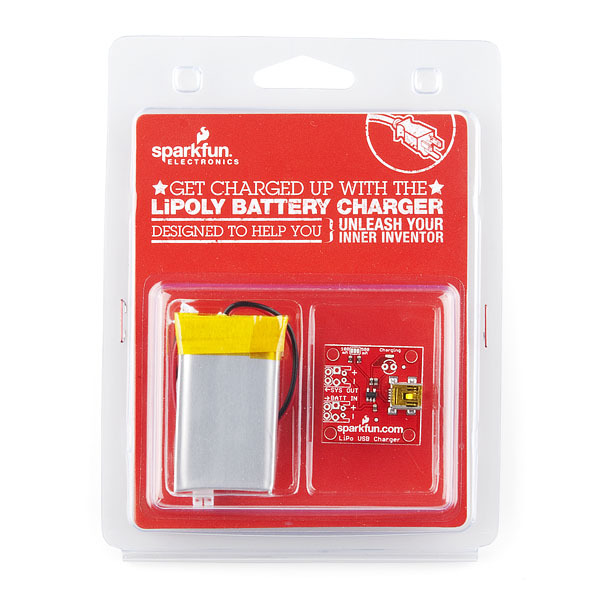 This handy kit includes both our USB charger and an 850mAh LiPo battery. 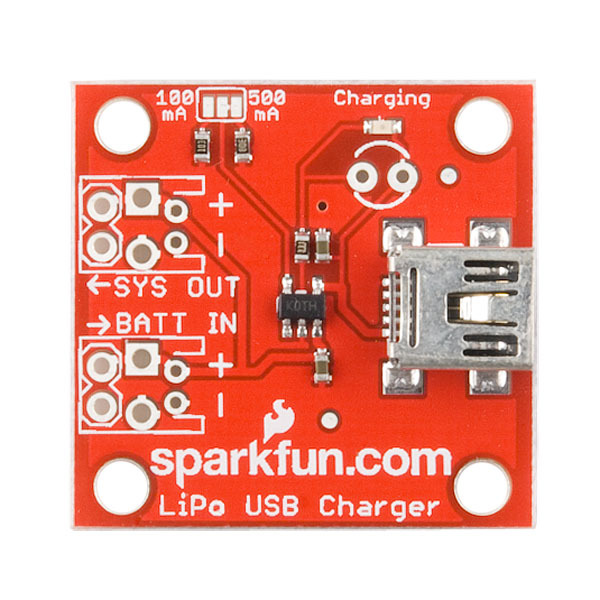 The USB LiPo Charger is a basic charging circuit that allows you to charge 3.7V LiPo cells at a rate of 500mA or 100mA per hour. It is designed to charge single-cell Li-Ion or Li-Polymer batteries. The board incorporates a charging circuit, status LED, selectable solder jumper for 500mA or 100mA charging current, external LED footprint, USB input, mounting holes, and various holes for your own connectors. We include a single JST-type connector which connects directly to our LiPo batteries. The connector comes unsoldered, so you can use it or not. There is also a 'SYS OUT' which allows you to connect the charging circuit directly to your project so you don't need to disconnect the charger each time you want to use it. Also included is a 850mAh LiPo battery. This is the highest energy density currently in production. Each cells outputs a nominal 3.7V at 900mAh! Comes terminated with a standard 2-pin JST connector - 2mm spacing between pins. Battery includes built-in protection against over voltage, over current, and minimum voltage. I see the charging circuit has built in protection against over voltage, is this effectively protection against overcharge? Say I left this charging for 24 hours, obviously not ideal, but would I come back to a smoldering pile of rubble? what are the dimensions of this ic? From the Eagle files (v21 revision) it should be a square 1.1" x 1.1" (27.94mm), however from the product picture it's not quite square and closer to 30mm on the long side. I have a question. My carger is set to charge at the default 500mA charge current. The battery that I have is 1000mAh. I have had the battery plugged into the charger for over fourteen hours now, and the charging light is still on. Does the light go off when the charge is complete, or is it up to you to figure out the charge time and just remove the battery when it's done? Hi, I'm using a board with the IC MCP73831, when connected to USB port only thing it does is light the LED every 30 seconds, also if you connect the battery. the supply current is minimal, we note that not charging. know what that means?. thank you very much. 500mA per hour? Did you mean 500mAh per hour, or more simply, just 500mA? Just a note for the next time you revise your retail packaging--it'd be nice if you indicated the battery specs on the box and/or made sure the batteries went into the blister pack with the printing facing out. I almost impulse-bought one of these at Micro Center today, but held off because I didn't know what the capacity was. 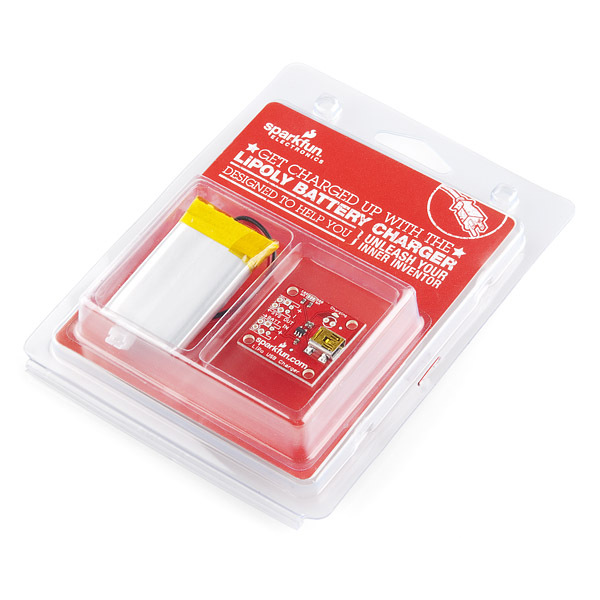 I bought this package, but I can't figure out if there is any kind of protection against discharging the battery too much. As far as I understood, LiPo batteries can not be driven to less than approx. 20% of their capacity without damaging the battery. So does the battery itself monitor this or can the charger do it if I'm using the SYS OUT connectors? I opened up the yellow tape on one of my batteries to try and find the answer to this. The one I opened up was a 1100mAh from Sparkfun. I presume all the other sizes of batteries come from the same manufacturer. There is a battery protection circuit on this battery, and one of its functions is to protect against overdischarge. If I recall correctly, it cuts out when the battery voltage gets down to 2.5V, and re-enables when the voltage gets back above 2.75V. These are lower numbers than I have heard (around 3V minimum) but I have let these things discharge with no extra protection other than what's under the yellow tape, with no explosions, no physical changes to the battery at all (heating, bulging, etc) and no apparent loss of life. I have yet to need to withdraw a battery from service due to overdischarge or any other reason, and some of my batteries are two years old. I posted the question above. Thanks a lot for your answer, that sounds reassuring. I will give it a go tomorrow. Oh. I just read the product description again, and it says right there in the text that the battery has its own protection. I don't know how I missed that, silly me. Unfortunately I don't have the part number for the battery protection circuit any more. Caution: doing this may void your warranty, but thats what Sparkfun customers do anyway, right? You can carefully peel back the yellow tape, then the masking tape underneath, to reveal a small circuit board with the battery soldered to one pair of terminals and the red and black wires to the other. There is one (or maybe two, I don't remember now) chips on that board, in addition to the various passive components. I was able to read the part numbers and type them into Google. One of the hits was for a LiPo control circuit. If you are careful, you can re-wrap the tape and keep using the battery with no trouble afterwards. Just don't flex the metal tabs connecting the battery and board too much. This says that the overdischarge protection kicks in at 2.4 plus or minus 0.1V, and reactivates once the battery is charged up to 3.0V. It is unclear, does this come with the JST connector required to attach the battery to the charger? I was in Microcenter this weekend (picked up the GPS shield) and saw this product. I noticed that the board in the package does not match the picture on the back of the package. I see the same mismatch on the product images on this product page. The board has two positions for connectors but the image on the back of the package shows three. It would seem the batteries are out of stock, yet you have packaged up 226 of them into these packages. Anyway I can get the battery from one of these? I need the 900mAh battery (that now seems to be changed to an 850mAh battery), not the charger. I have the FIO with a built in charger. Someone help! I'm putting in the order for the backordered battery now. It can be a tough call splitting stock between the storefront, production (which uses the batteries in several products), and retail packaging, because once the stock is committed to a given purpose it's difficult to re-allocate. The good news is that we always have inbound shipments of batteries and they'll be back on the storefront soon. If you need something faster, Paradoxial's right, contact customer service. Contact customerservice@sparkfun.com. They might be able to arrange something for you. Is there anything like this for a 5V or 6V battery? yes, it can work. 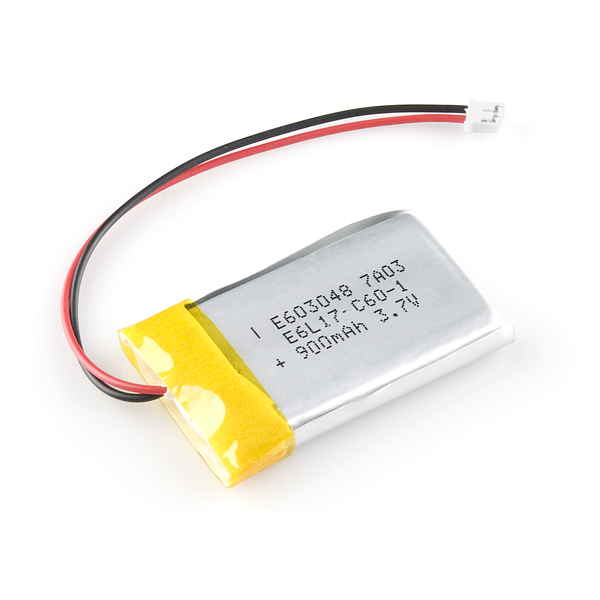 the 6aH is just a single cell lipo, like the others. 1. Will my project be powered by the battery when I am NOT charging? 2. Will my project be powered when I am charging? 3. Will my battery be charging AND will my project be powered at the same time when I am charging? I will greatly appreciate it if anyone can help me with this. I have exactly the same questions. Can someone reply ? 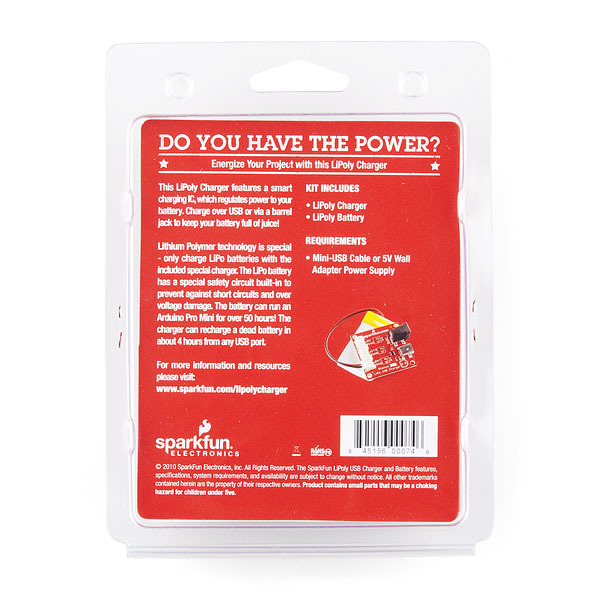 Hi, This is a great little charger that is intended to do just ase you have described and let you power a project without disconnecting the charger. 1) Your project will be powered when not charging. 2) I will have to double check but I believe you will not be able to power the project while charging. 3) Is pretty much the same as #2, and no it would not. Thanks for your reply. So I can connect the "SYS OUT" to the JST connector of let's say a Razor IMU ? That's right. SYS out should be able to connect to any device that can handle 3.7V. The Razor could definitely be attached to the SYS OUT. does this come with the JST connection that you can solder in? or do you have to buy it seperatley? Can a future version include breakouts to connect to the non-power pins of a mini USB? Then I can use this to also transfer data. Is it a dollar cheaper to buy these two items individually? The picture of the back of the packaging doesn't agree with the front. On the back, it shows a board with a barrel jack /and/ a USB port. The pictures showing the board itself show just a USB port. Which is correct? "included is a 900mAh LiPo battery. This is the highest energy density currently in production"
You can buy 10A single cell Lipos everywhere. But the price is a lot higher than what you are charging for this kit. I think they mean that if you get a 900mAh battery that isn't li-poly it will be physically larger. Not that they aren't available. Energy density is how much power can you pack into each given unit of space. Seems the link is missing to the tutorial for safely unplugging the JST connector.